One of our Detroiter buddies, Andrew, sent these candids of a European model Honda Civic as seen on the streets of St. Clair shores. 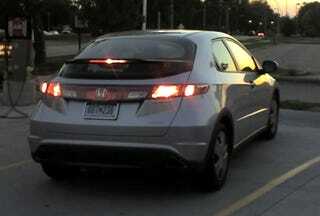 He says: It was wearing an M plate and had dual triangular exhaust tips through the bumper cover like a CTR. The guy really didn't enjoy me taking pictures of it. We're suckers for this fish-out-of-water stuff, even if all it means is that someone has a loophole to the DOT, usually for testing purposes. And remember, that's not blur, that's action! And further remember, send any and all out-of-place car sightings to tips@jalopnik.com.